Join us during a special night organized in collaboration with María Tello, member of the Spanish Business Council. 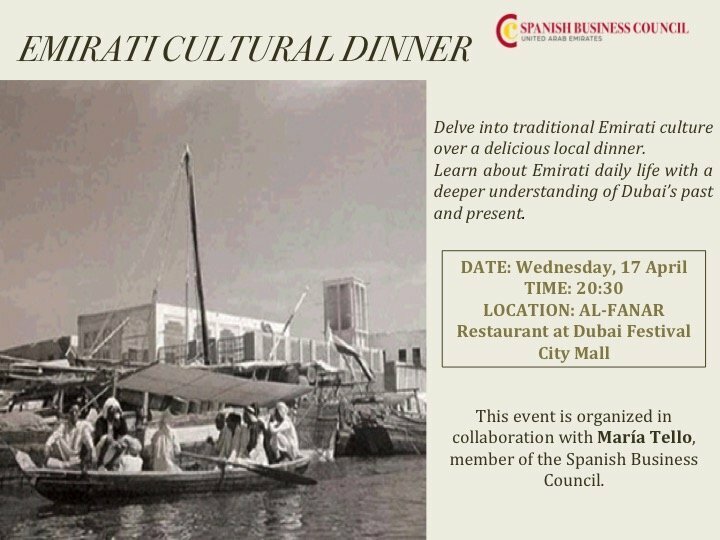 Delve into traditional Emirati culture over a delicious local dinner. Enjoy a tasty feast of local specialities and soft drink. The event will start with Arabic coffee and dates followed by a wide selections of Emirati cuisine. As you eat, enjoy a question-and-answer session with a local expert, Nasif Kayed, covering local culture. Learn about Emirati daily life and leave with a deeper understanding of Dubai’s past and present.